‘The Journals of Matthew Quinton’ are set principally during what are known as ‘the Anglo-Dutch wars’, but like most generalisations used to describe historical periods, that label actually conceals a much more complex picture. For one thing, the wars were not exclusively Anglo-Dutch: the second, from 1665 to 1667, also involved France, Denmark-Norway and even the Prince-Bishop of Munster, while the third, from 1672-4, was part of a much larger conflict that the Dutch regard as effectively their second war of independence, fought overwhelmingly against the French. The same is true of the colonial conflicts that form the backdrop of The Mountain of Gold, the second book in the series. Anglocentric sources have sometimes seen the colonial conflicts of the early 1660s as being primarily between the English and the Dutch, especially in West Africa, but in reality many European powers, including some pretty unlikely ones, were scrabbling desperately to get their hands on slices of colonial action. Much of the action of The Mountain of Gold is set on the River Gambia, but there are allusions to the larger expedition undertaken by Major (later Sir) Robert Holmes in 1663-4 against the Dutch forts on Cape Coast and the Gold Coast. But several of these had only very recently become Dutch; until 1663 several of them had been Swedish and bore Swedish names like Carolusborg. There were a number of Danish outposts, too, and the French had already established Fort St Louis, later Dakar, which features in The Mountain of Gold. Perhaps most bizarrely, the Duchy of Courland – which occupies part of the land area of modern Latvia – held St Andrew’s Island in the Gambia River, although this was sold to the Dutch shortly before the Holmes expedition arrived and conquered it, turning it into James Fort (which later became an important centre of the slave trade). Having made a few slight tweaks to the chronology, I’ve used the Courland element in the book; indeed, the climactic battle takes place on St Andrew’s Island. But this was not the sole extent of Courland’s imperial ambitions: Duke Jakob, a godson of King James VI & I, also acquired the island of Tobago, although this was abandoned to the Dutch in 1666. Of course the larger nations had also established themselves in north America, not always successfully. New Sweden, established in 1638, was a quite extensive colony along the River Delaware, including parts of the modern states of Delaware, New Jersey and Pennsylvania. But during the Northern War of the 1650s, the Dutch moved against this colony and overran it in 1655. Their triumph was brief: in 1664 ‘New Netherland’ was conquered in turn by the British, and part of the former Swedish colony was sold to Sir George Carteret, a colleague of Pepys on the Navy Board (and who appears as a minor character in The Mountain of Gold), who named his territory after the Channel Island which he called home, thus establishing New Jersey. Meanwhile Colonel Richard Nicholls had led an expedition to annex the small Dutch settlement of New Amsterdam, which was duly renamed New York after Nicholls’ patron, the Lord High Admiral and brother of King Charles II. The Nicholls expedition is recreated in Broadside, an excellent but regrettably little seen documentary in which I participated. By coincidence, the two effective ‘creators’ of New Jersey and New York both lie buried about five miles apart, just a short distance from where I live in Bedfordshire. 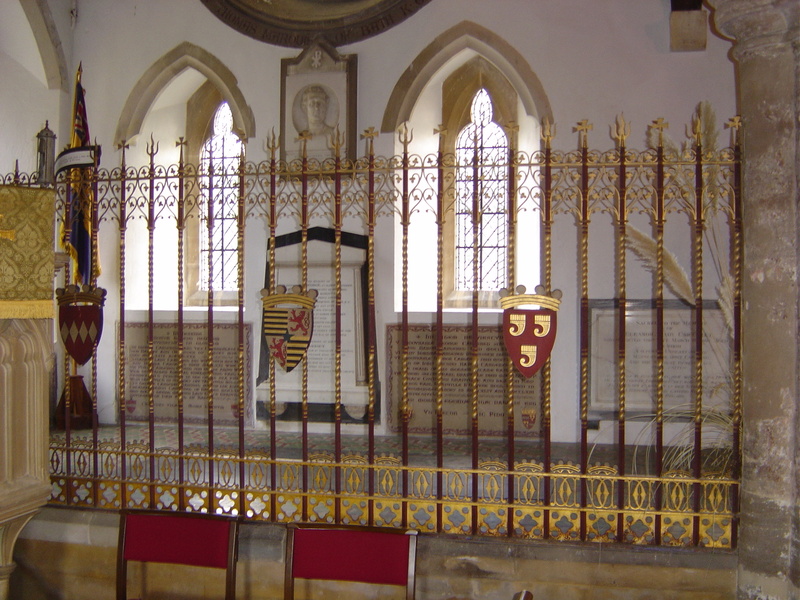 Carteret lies in a fairly bland family vault at Haynes church (right), but Nicholls’ memorial (below), in St Andrew’s Church, Ampthill, is spectacular. A florid Latin inscription describing how he removed the Dutch from New York (‘belgis expulsit’) is surmounted by the Union flag and the stars and stripes flanking the actual cannonball that killed him while he was attending upon the Duke of York during the first naval battle of the misnamed third Anglo-Dutch war, the battle of Solebay on 28 May 1672. 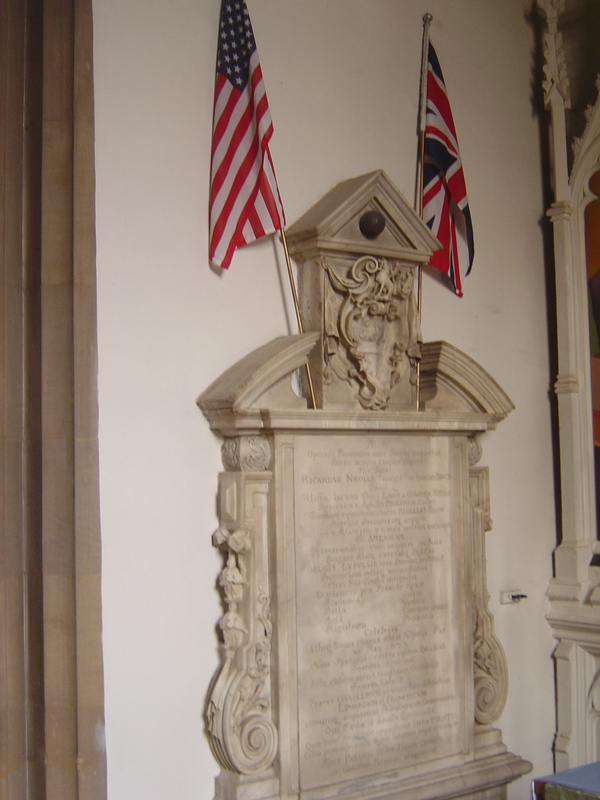 My geographical proximity to these two memorials to the colonial conflicts of the 1660s was one of the factors that inspired the plot of The Mountain of Gold. I don’t often get to read your blogs in full but this was very interesting. Must go back to your other ones. Wonder if I’ll ever get to see that ‘Broadside’ documentary. There is talk of setting up a New Llanelli in Bedfordshire apparently. Intertesting during this period is the situation of Surinam. After changing hands several times, by 1667 it was in the hands of the English. At the Treaty of Breda England offered the Dutch New Netherland in exchange, but they prefered Surinam – obviously the most valuable at the time. Which left England with New Netherland/York. One of those “what if” moments? Absolutely. The history of that whole area is fascinating; a few months ago I read John Gimlette’s Wild Coast on my Kindle, which covers all three of the old ‘Guianas’ and includes some simply extraordinary and very little known history.